Mr. Wong first came to American High School in the fall of 1993, serving as the walk-on after school Band Director. He returned in 1995 to rebuild the music program. He started an elementary instrumental music program after school in the American High attendance area in 1996 and brought jazz workshop to students as a class in 1997. 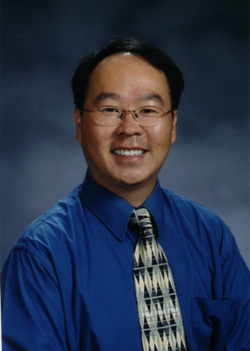 The music program’s growth helped Mr. Wong create a year-long Symphonic Band and Concert Band during the 2001-2002 school year. Under his direction, the concert and symphonic bands have received consistent excellent and superior ratings at festivals. Mr. Wong has received grants to bring technology and equipment to music students. He has served as a Technology Mentor in the Fremont Unified School District, has been recognized as NUMMI’s Most Promising New Teacher, a PTSA Founder’s Day Award winner, and as Staff Member of the Month at American High School, where he currently teaches. Mr. Wong is a member of Music Educators National Conference, California Music Educators Association, Northern California Band Association, California Band Directors Association, American Choral Directors Association, International Society for Music Education, California Teachers Association, and the National Education Association.